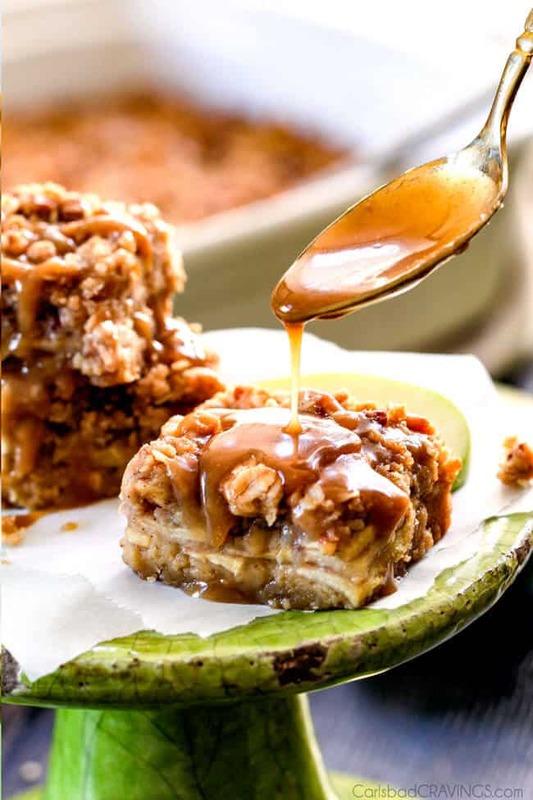 Easier than pie Salted Caramel Apple Pie Blondies with a soft, chewy buttery blondie base, layered with cinnamon apple filling and topped with brown sugar pecan streusel drizzled with silky salted caramel! All the flavors of apple pie but made even better as a blondie bars! I always love hearing (and even better yet tasting) different families traditions and its always fun creating new ones! I spent Thanksgiving with some friends a few years ago so instead of just our family traditions we had a smorgasbord of foodie family traditions that was such a treat. Among other things, I brought my Toffee Pecan Caramel Pound Cake and a Butterscotch Pumpkin Pound Cake (coming soon) and we all reveled in each others culinary creations. So now I bring you hopefully a new favorite family tradition – Salted Caramel Apple Pie Blondies! Apple Pie has to be one of the most beloved American classic desserts. Add salted caramel and it has to be one of the most cravilicious desserts. 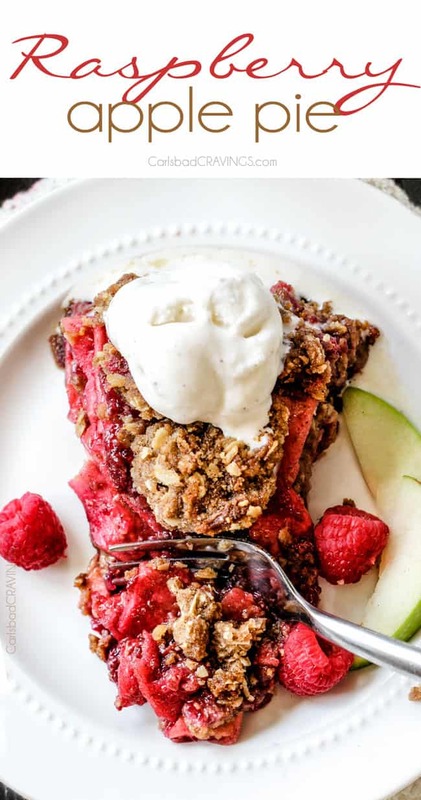 Swap out the crust (which usually doesn’t do much to enhance a dessert in my opinion) for a soft melt in your mouth blondie base and top with crumbly Pecan Brown Sugar Streusel and we are talking can’t-stop-eating-deliciousness. And I call them Caramel Apple Pie Blondies. Thank goodness apples are easy to come all year because this is one Fall Dessert you are going to want to make year round. 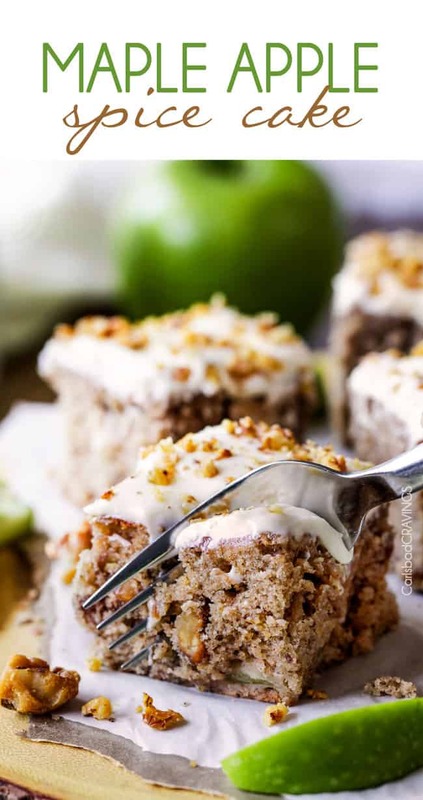 These Salted Caramel Apple Pie Blondies are pretty easy to make and don’t even require a mixer! 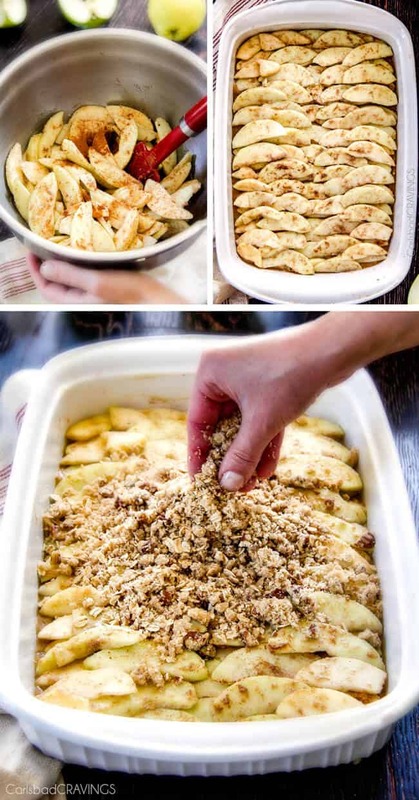 The most time consuming part will be peeling your apples which you can totally put your kids to work for and cutting your butter into your streusel that takes all but 5 minutes. 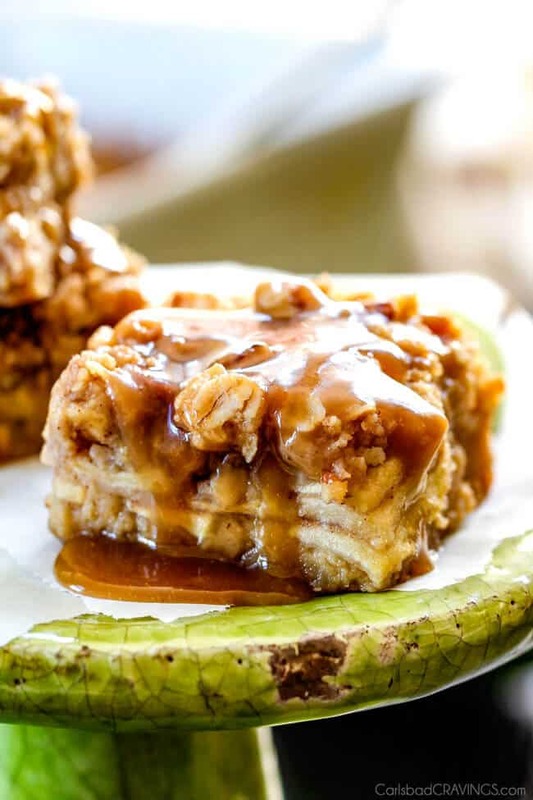 To make your Apple Pie Blondies, first, you prepare your Brown Sugar Pecan Streusel that I adapted from my 7 Layer Candy Apple Cheesecake Bars (I dare you to try that explosion of yum!) that includes pecans, oats, brown sugar, cinnamon and plenty of butter – yumm-o. Struesel should be the crowning glory of any proper apple pie and these Salted Caramel Apple Blondies boast a heavy layer of its glory. Next, you whip together your Blondie Layer that I adapted from my Butterscotch Coconut Blondies that I am completely obsessed with. These blondies are soft, chewy, rich with an irresistible brown sugar, buttery texture. Bake the blondies for 10 minutes then top with your apple pie filling which is a simple tossing of apples with a little butter, brown sugar, flour and cinnamon. Top with your aforementioned glorious Brown Sugar Pecan Streusel and bake for another 10 minutes. The apples will bake down into the blondies for a tender apple infused blondie bar. Finally, we top it all off with creamy, dreamy, fool proof Salted Caramel Sauce. You might be tempted to use storebought, but there is NO comparison to this homemade Caramel Sauce! It is one of the first recipes I ever posted and continues to b a favorite that you will eat by the spoonful. These bars only require half a recipe but I strongly recommend making the whole recipe and drizzling any leftovers over ice cream or eating it by the spoonful. Because you will want to eat it by thee spoonful. My sister in law makes this homemade Caramel Sauce for Christmas Gifts ever year and now you can gift it drizzled all over these Apple Pie Blondie Bars AKA sweet, salty, soft, chewy, brown sugar, cinnamon apple bars. 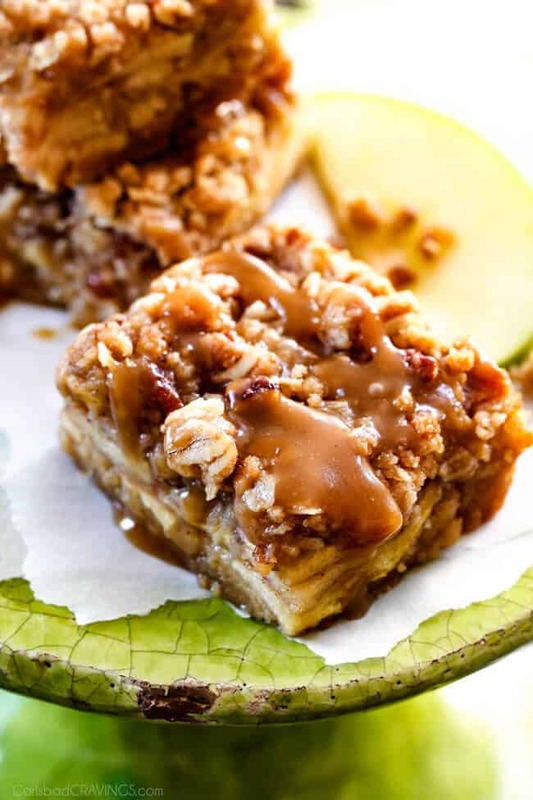 Want to try these Caramel Apple Pie Blondies? 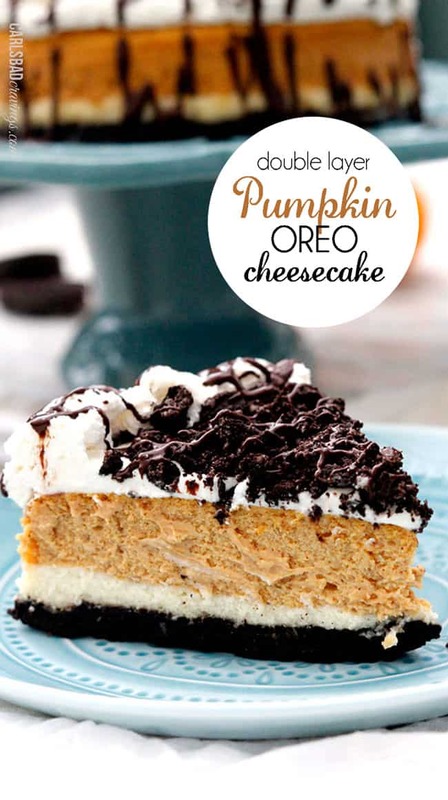 Pin it to your DESSERT, FALL, or THANKSGIVING Board to SAVE for later! Streusel: In a medium bowl, mix together flour, brown sugar, oats and cinnamon. Cut in butter until crumbly with pastry cutter or two knives/forks (this will take a at least 5 minutes). Stir in pecans. Refrigerate until ready to use. Blondie Base: Spray a 9x13 baking dish with nonstick baking spray or to easily remove blondies, line baking dish with overhanging foil or parchment paper and spray with nonstick spray. Set aside. Whisk flour, baking powder and salt together in medium bowl; set aside. Whisk sugar and melted butter in a separate medium bowl until combined. Mix in eggs and vanilla until well combined. Using a rubber spatula, fold flour mixture into egg mixture just until combined. Do not overmix. Pour into prepared baking dish and bake at 350 degrees F for 10 minutes. Apples: Meanwhile, add all of the Apple Topping ingredients to a large bowl and toss to evenly combine. Set aside. Assemble: Remove blondies from oven after 10 minutes. Layer with a single layer of apples (I did 3 rows) and then another layer of apples on top of that until apples are gone. 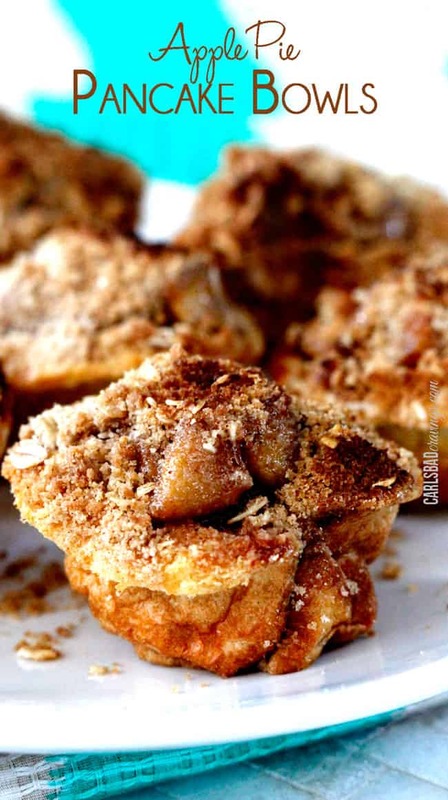 Evenly sprinkle Pecan Streusel over apples. Bake: at 350 degrees F for 20-25 minutes or until blondies are cooked through and apples are tender. Let cool completely on a wire rack before removing from pan. Refrigerate if not serving immediately. Easy Creamy Caramel: Meanwhile, prepare Easy Caramel according to directions. Add an additional 1/4 teaspoon salt plus more to taste if desired. 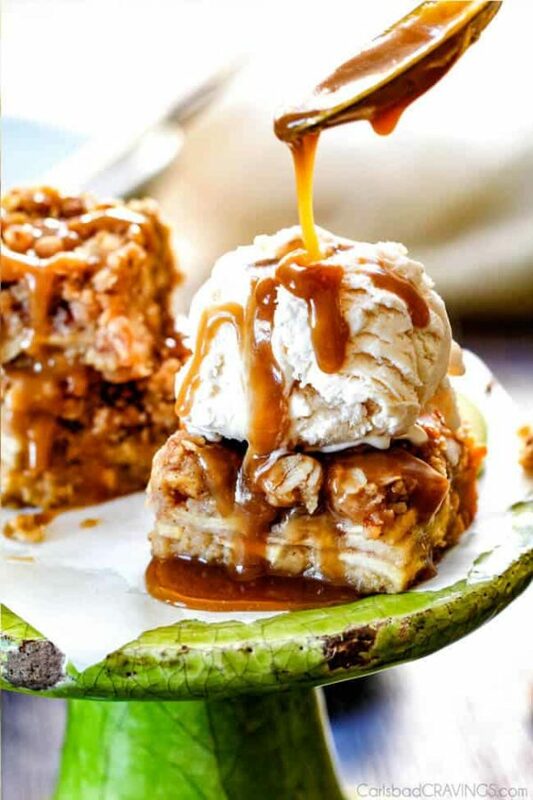 Drizzle bars with desired amount of caramel OR top individual bars with vanilla ice cream (optional but highly recommended) and drizzle with desired amount of caramel. 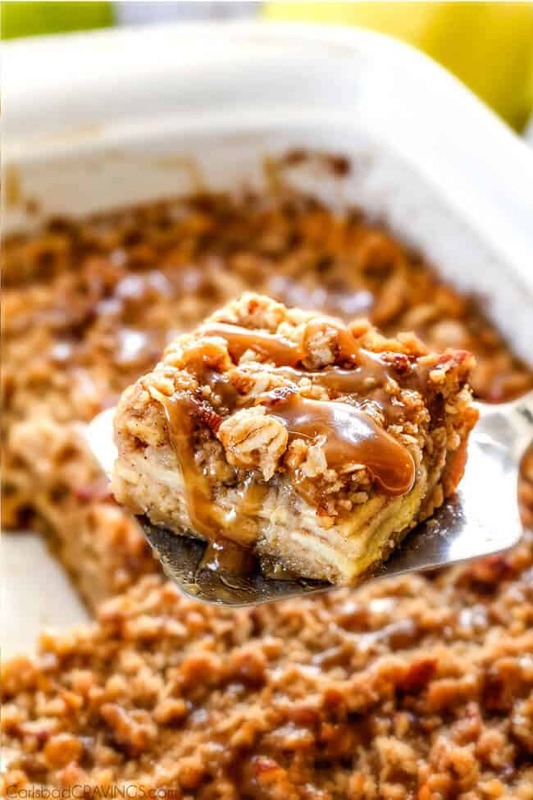 *This recipe only requires 1/2 recipe Caramel but I recommend just making the full recipe and drizzling recipes over ice cream or eating with a spoon. Because you will want to eat it with a spoon. LOL! I believe you because we did 🙂 So hard to say no to this combo! I hope you have a great weekend Anna! This has got to be some conspiracy!! I wake up and say I”m starting a diet and then I find this kind of post in my email. It is totally unfair. It looks irresistible. I guess I can always wait to start my diet next week 🙂 Have a great weekend. I made these tonight for dessert and what can I say? Yet another fabulous recipe! How do,you do it? I have yet to make something of yours that isn’t fantastic. Thanks!